The word “lemonade” will never be the same. Thanks in part to Beyoncé’s epic album, the “when life gives you lemons, make lemonade” cliché is reaching a whole new generation, and it’s inspiring me to continue to stay positive no matter what lemons roll at my feet. Lately, life overall has been pretty lemon-free, in that I am happy. Life is good. It’s summer. I’m in a wonderfully fulfilling relationship. The most important people around me are well. However, as a writer, there’s this complicated thing that always happens when I’m actually happy: I can’t write. That’s because I have this unconscious routine of writing best when I’m in desperate need of answers, struck with worries of the heart and soul. While I’m always in search of what’s next for Style Darling Daily, my writing, and my professional life, I’m not necessarily haunted by any lack of progress to the degree where I have to write it all out to come up with a plan to advance my career. When I’m happy personally, I’m much more carefree with other parts of my life. My hard-working nature isn’t any less apparent, but I let inspiration find me like a cinematic meet cute. Inspiration is like an old friend I run into at Starbucks. I know the words are there, but I can’t always find them. Well, since I’m writing now, there must be something on my mind. Let’s take a little trip down memory lane. With all that’s been going on lately, I’m reminded of my mission as a blogger. I wish to portray what I really wear on the daily (hence my “one stylish day at a time” tag line) and where I invest in my style because after all, I’m a budget shopper who believes in always looking my best out of respect for myself and those around me. I don’t dress just for a picture or to represent myself lolling about in some luxurious life of high fashion and glamour. That’s certainly not the life I live. I mean, I live on Long Island! I support myself financially. These aren’t complaints either, just my reality. Also, I don’t have a fancy camera or nearby scenic locations for spur of the moment photo shoots, nor do I often have backup to set up where and when I can share my daily outfit images. There’s plenty of evidence (with pictures taken in my bathroom or at my parents’ house) of how I’ve styled my summer thus far on Instagram (@styledarlingdaily). In addition, there also aren’t many words that go along with those posts. I know, I know. Writers should be writing. On the upside, when I don’t have the words to express what’s going on with my style, I let the images (and hashtags) do the talking for me. I share my style inspiration for my two jobs where I can thankfully wear clothing that actually suits my personal style, so there isn’t much distinction in my closet between work and non-work apparel. At most, I pack an extra pair of shoes to switch from power heels to ballet flats for the change in shifts when I have to work both in the same day. Because of these day-to-day experiences (which don’t allow for proper photo shoot scheduling), I’m always seeking great deals on unique pieces that lend a stylish hand in how I express myself amid the chaos that is being a working woman in 2017 (not to mention, a happy one at that)! I digress… we were talking lemonade earlier. 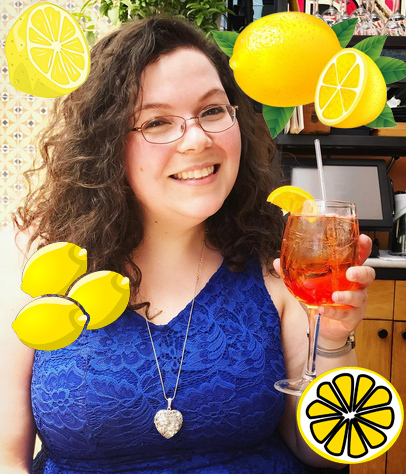 Without getting into the lemon details (because I would never use my blog, writing, or social media to bully or hurt anyone whom I love), I recently found myself in a situation where I was no longer in need of a formal gown. The money I’d spent on the garment could not be refunded, nor was I permitted a store credit to use in the future. The dress itself was lovely, but certainly not a color that flattered my skintone or shape, so keeping it was simply not an option. In order to lemonade the whole thing, I realized I needed to reinvest the dollar amount in something that I would get much more use from, therefore resolving my predicament in the best way possible. To relieve some of the mystery, I’ll share that I was at a local David’s Bridal, where their staff was very helpful and supportive as I pursued stylish options. However, I was not very impressed by their in-store dress selection to make an exchange. Certainly, there were plenty of beautiful colors, flattering styles, and youthful designs to shop through, but nothing special was speaking to my style blogger soul. One of my jobs is working as a stylist at a dress store, which also contributed to the fact that I wasn’t necessarily in need of a fancy party dress anyway. In a last stitch (pun!) effort, when looking at the rows and rows of pastel, sparkly, and ruffled chiffon, I sorted through my mental wardrobe catalogue to assess my existing dress options, what with three weddings and a Sweet Sixteen all scheduled in the span of a very busy and exciting month this coming fall. Basically, I didn’t want a new dress because I was already well-equipped in that department. Suddenly, it occurred to me that shoes and accessories were often easier to pique my interest when in a shopping rut just like this. When it’s summer, I will only wear shoes that are comfortable. There are so many factors concerning weather (sweating in a heavy garment or taming my curls in the humidity) that invade my style routine for this hotter season, so I’m more than likely to be seen in flats, sandals, or flip flops on a regular occasion, rather than opting for the super fashionable high heel. Low and behold, David’s Bridal has a pretty amazing selection of footwear that had me in giggles. Generally, my everyday outfit will have some sort of sparkle to it, and if it’s not a statement necklace or big earring, my shoes will shine with studs or sequins. 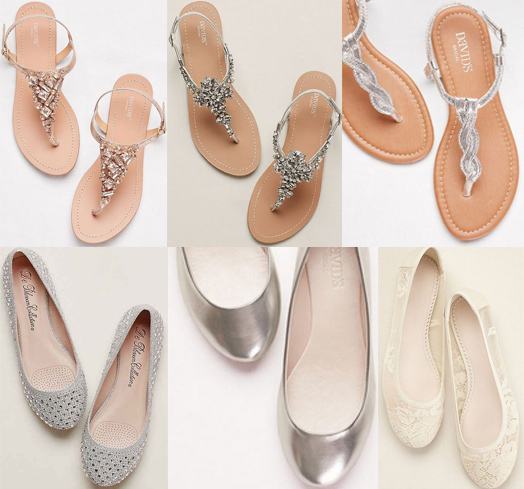 Of course, the selection of shoes at David’s Bridal is so blingy and meant for a bride, but that doesn’t mean that I can’t make these “bridal” shoes a reality for what I like to wear. I was so pleased with the discovery of finding fashion that fit my style in this unlikely place, especially when I’m not in the bridal market. For the price of one gown, I was able to take home six pairs of shoes with only spending an additional ten dollars to offset the difference I owed, on top of a Buy One, Get One 50% off sale and coupon discount for the most expensive item. I felt accomplished and that I was making lemonade to benefit my style, shopping savvy, as well as quelling my soul of the recent circumstances that brought me to David’s Bridal in the first place. Furthermore, I rediscovered my love for the sandal. Gladiator flats and those pom pom sandals are all the rage every summer, but neither trend felt quite like me. Typically, I embrace trends that best work for my body type and personal style. I never encourage anyone to do the reverse. What happens is that we start asking ourselves what’s wrong with our bodies just because we don’t fit into some industry mold of what’s current and fashionable. I’d rather be of the mindset that something doesn’t work for me, as opposed to me being unsuccessful with that external force. I love to wear pieces that best represent the feminine and detailed way I approach fashion. These metallic sandals (here, here, and here) are neutral for any summer ensemble, including a maxi dress or blouse and skirt outfit. Also, the ballet flats (here and here) will be the perfect way to dress up a casual look, while the lacy white pair (here) will definitely serve regular rotation with my floral summer dresses that I can wear either to work or for date night with my boyfriend. Upon this shopping win, what came next was a swarm of reminders that bargain buys and surprise fashion finds are happening at so many unlikely stores that we as shoppers and busy women might forget about. A few months ago, my boyfriend and I were at BJ’s in pursuit of a discounted movie ticket package deal when I saw rows and rows of clothing. I’m not a regular BJ’s shopper, so I was shocked to learn that the warehouse store sold more than just fleece jackets or packaged underwear. I scanned the racks to see cute fit-and-flare scuba dresses, classic jersey frocks, and striped maxis, all perfectly priced if one was in need of a proper summer wardrobe update without breaking the bank. I’m always saying that shopping should be easy. While it comes more naturally to some than others (because some know their style and body type so well, while others are more hesitant or uninformed), to conveniently access fashion in an unexpected way is a delight and inspiration to write about. Since my summer shoe game is all about comfort and function (of course, style never goes by the wayside either), I’m often acquiring my favorite selections at Juniors’ stores where shoes and jewelry are basically the only items available where size isn’t an issue. Juniors’ stores such as Mandee, Charlotte Russe, and Forever 21 all size to fit a younger and mostly slimmer-figured consumer. Although, it is worth mentioning that these retailers have expanded their brands to include stylish options for shoppers of all sizes. However, I’m a most frequent patron of accessories in these stores. Albeit, they don’t always cater to uncommonly smaller or larger shoe sizes, nor are wide sizes always available, but I’m more often than not able to find jewelry, shoes, and other accessories at reasonable prices to build a unique and special collection that works with my everyday style. During the holidays last year, when I was in pursuit of gifts for coworkers, I sought festive bulk items like ornaments or tea and hot chocolate varieties. I have that “last one picked in gym class” complex (which I basically accept now since I usually never wanted to play in a sport anyway), so I wanted to make sure I extended the joyful spirit of the season to everybody at both of my jobs, an effort that annually proves to be quite the challenge to my budget. However, as I loaded up my cart at a local Big Lots, I found a display for sterling silver jewelry, decked out with chic drop earrings and charm bracelets (all in the vain of modern costume / fashion jewelry) that made my heart sing a song of style. It was such a lovely surprise and while these pieces were all under five dollars, I treated myself and some close friends to a little extra sparkle. Speaking of a little extra sparkle… that’s all that any Style Darling really needs. It doesn’t have to be the holiday season or literal sparkle in the form of jewelry either. Sparkle and lemonade are basically the same metaphors to me: doing one’s best and making the best out of a negative. That’s all that really matters. If the solution results in six pairs of shoes, or a stylish bargain buy that represents who you are as a strong, kind, mindful, creative, beautiful individual, then any lemons along the way are worth their trouble. Here’s a video of a live performance of “Silver Lining” by one of my favorite country singers, Kacey Musgraves. The silver lining, lemonade, or sparkle aren’t always obvious during an unfortunate circumstance, but I always have faith that I’ll find that positivity. Happy Styling! This entry was posted in Accessories Access, Basics for a Bargain, Essays, Inside A Style Blogger's Closet, Quickie Darling Deal & Steal, Show Me The Shoes, Style Darling Daily, Style Tip and tagged Accessories Access, Big Lots, BJ's, blog, Blogger, blogger life, blogger style, bloggers, blogs, bridal, bridal style, Charlotte Russe, David's Bridal, drama, empowerment, essay, fashion, fashion blog, fashion blogger, fashionable, fashionista, Forever 21, good vibes, goodness, Inside A Style Blogger's Closet, Instagram, lemon, lemonade, lemons, Living in Style, Mandee, my syle, positive, positive thinking, positivity, shoe, shoe love, shoe lover, shoes, shopping, Show Me The Shoes, style, style blog, style blogger, Style Darling Daily, style for all, style for days, style inspiration, style inspo, stylish, wedding, write, writer, writers, writers life, writing. Bookmark the permalink. ← Accessories Access: Pom Pom Bags for Spring!